The Koitash W–Mo skarn deposit in the Tien Shan Gold Belt contained resources of 60 kt WO3 in altered skarn (averaging 0.56% WO3 and 0.029% Mo) and an additional 42 kt WO3 in separate zones of phyllic alteration (averaging 0.30% WO3, 0.97 g/t Au, 0.67% Cu, and 0.02% Bi). It is related to an Early Permian multiphase granodiorite–granite–leucogranite pluton that is composed of medium- to high-K, transitional metaluminous to peraluminous, weakly oxidized–weakly reduced, ilmenite–titanite series granitoids. The pluton was emplaced in a tectonic domain with inferred ancient continental crust; the latter, coupled with possible ascent of hot asthenospheric material, has likely defined a distinct W–Mo–Au metallogenic assemblage forming in a post-collisional environment. The deposit includes redox-intermediate prograde and retrograde pyroxene–garnet skarns, partially overprinted by propylitic and phyllic alteration assemblages, comprising scheelite, molybdenite, Cu–Bi–Ag–Te sulfides, and sulfosalts, as well as native Bi and Au. Compositional similarities between W–Mo deposits, containing Au–W–Cu–Bi mineralization in late alteration assemblages, and coeval intrusion-related Au-dominant (with minor W, Bi, etc.) deposits in the region support their possible genetic links. Fluid inclusion data indicate the involvement of carbonic-free moderately saline (10.5–15.0 to 8.0–11.7 wt% NaCl-eq. ), high-pressure (2000 to 1500 bars), hot (> 550–600 °C) aqueous fluid, which was sourced from crystallizing magma and formed prograde calcic skarn. This fluid was followed by moderately saline, Ca-rich (14–16 wt% NaCl, 19–21 wt% CaCl2), lower pressure (800 bars) fluids toward the retrograde skarn stage, with the deposition of scheelite in association with pyrrhotite and molybdenite, locally with minor fluorite. Propylitic quartz–amphibole–chlorite–oligoclase–calcite, with scheelite, pyrrhotite, locally molybdenite, assemblages formed from boiling high-methane aqueous-carbonic fluids at temperatures of 370–400 °C and pressures of 950–1000 bars. Phyllic quartz–sericite–Fe–carbonate, locally with albite, fluorite, chlorite, scheelite, molybdenite, and other sulfides, also Bi and Au minerals, alteration assemblages initially formed from homogeneous and then from boiling aqueous-carbonic, low-salinity fluids at temperatures of 365–370 to 300–315 °C and pressures of ~ 2000 bars. δ34S increases from retrograde skarn (δ34S = + 2.0 to + 2.3‰) through propylitic (δ34S = + 3.0 to + 3.4‰) to phyllic alteration (δ34S = + 4.2 to + 4.7‰) stages. The online version of this article ( https://doi.org/10.1007/s00126-019-00869-5) contains supplementary material, which is available to authorized users. 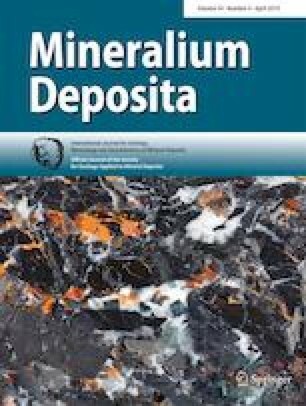 This paper represents part of the author’s work on research and assessment of tungsten and gold deposits in Central Asia. Editorial reviews by Georges Beaudoin, Pete Hollings, and two anonymous reviewers significantly improved the paper. The work was completed under financial support from the Program no. 48 of the Presidium of the Russian Academy of Sciences (PRAS-48) and the Scientific Program of the IGEM RAS.